Another good recipe to try. My husband and I don't eat potatoes that often, but this would be wonderful for a dinner party. Very elegant. I will come back later to get the recipe. Lynda, I HAVE to try these. My mouth is watering just reading the recipe. Oh my gosh, I just want a big pan of these all to myself! I've been on a lemon kick - it seems to brighten my day. I need to try these - both comforting and spring-like. These lemon potatoes look great. I'm always looking for new ways to cook my very favorite comfort food! I'll bet the flavor of lemon with the roasted potatoes is amazing...love it! 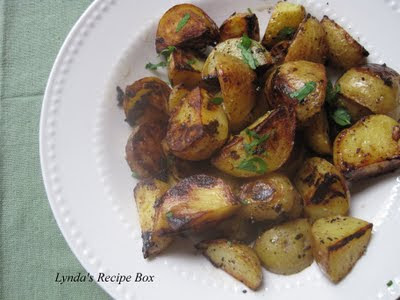 Those look yummy, I am always looking for new potato recipes and I love lemon! I'm a sucker for potatoes, especially recipes like this. What a great idea to use lemon...would never have thought of that. Came back to get the recipe. regardless of the type of potato used, this preparation is gonna be delicious. tasty work, lynda! This sounds very good. I like lemon with potatoes - it seems to really perk them up!